Welcome in India, You will be received by Premium India Tours representative at international airport and assisted to your hotel. In the Hotel you will have a brief description of your tour and the representative will hand over your documents regarding the tour, Overnight in Hotel. After breakfast take sightseeing tour of historic city visiting Old Delhi visiting the majestic Red Fort, a marvel in red sandstone, Jama Masjid, the largest mosque in India, both built by emperor Shah Jahan of Taj Mahal fame, Rajghat - memorial of Mahatma Gandhi & a Rickshaw ride past through the silver street in Chandani Chowk, the city tour continues covering New Delhi, visiting Rashtrapati Bhawan, one-time imperial residence of the British viceroys; the India Gate, a memorial raised in honour of the Indian soldiers martyred during the Afghan war; the Laxmi Narayan Temple, built by the Birlas, one of India's leading industrial families; Humayun's Tomb, lotus shaped Bhai's Temple , Qutub Minar , built by Qutub-ud-din Aibek of the Slave Dynasty; in the evening you can visit see speculative Light and Sound Show at Red Fort. Return to the hotel for overnight at the hotel. After breakfast, depart for Agra en route visit the Sikandra, mausoleum of Emperor Akbar built in 1492, The Tomb is combination of Muslims and Hindu Architectural styles. After visit continue to drive to Agra, on arrival transfer to hotel. After lunch you visit to witness incomparable Taj Mahal with its' speculative view. Taj Mahal, the architectural modern day wonder of the world; this monument is a fine example of the fusion of many architectural styles is one of the wonders of the modern world. Taj, endowed it with some of the loveliest buildings in the world. The tour continues with a visit to the Agra Fort from where one can get the most moving view of the Taj from the little octagonal tower in the Agra Fort which lies across the river Jamuna, followed by visit to Pearl Mosque and the Tomb of Itamad-ud-Daula built by Empress Noorjehan in memory of her father. In the evening you may visit to the souvenirs market of Agra, one should visit Oswal Emporium where they have built a Mini Taj Mahal inside their showroom and it took 10 years for the artists to complete the mini replica of the Taj. The show room conducts free sound & light show showing the eras of Taj Mahal. Overnight in Agra. After breakfast drive to Jaipur en route visit Old deserted town of Mughal Dynasty - Fatehpur Sikri built in red sandstone in honour of Saint Salim Chisti who foretold the birth of 3 sons to Emperor Akbar, is an example of robust stability combined with originality. Each important edifice here represents a type by itself. Notable among them is the Diwan-e-Khas, Punch Mahal, the Tomb of Salim Chisti, and the Bulund Darwaza. Later continue to proceed to Jaipur. Rest of the day at leisure, in the evening hours enjoy walking in the colorful streets and bazaars of Jaipur City. The beauty of Jaipur is that its unique architecture and town planning is visible at even the most common places such as its squares and lanes. Overnight at Hotel. After breakfast explore the Pink City with an excursion to Amber Fort, situated just outside the city, enjoy the experience of ride on elephant back to and from the top of the hill on which the fort is situated. Afternoon sightseeing tour of City Palace in the heart of Jaipur is known for its blend of Rajasthani and Mughal architecture. Not far away is the Central Museum. Jantar Mantar is the largest of the five observatories built by Sawai Jai Singh. The Hawa Mahal or the Palace of Winds was constructed for the royal ladies to watch the royal processions without being seen, all monuments are located in the vicinity of City Palace Complex of Jaipur. Later late afternoon is kept free to visit the famous Markets of Textiles, Gems, Carpets, and handicrafts. One can also visit Nahargarh Fort to see it illuminated over the floodlights. Return to the hotel for overnight. Morning drive to Bikaner (300 kms/6 hrs), Bikaner, situated in the northern part of Rajasthan, The city is surrounded by high fortifications comprising a seven-kilometers long wall which encircles the old city and has five entrances-all constructed in the 18th century. Later enjoy sightseeing tour of Bikaner, offers several attractions to the tourists besides, of course, the exotic camel safaris. Some of the major attractions around the city are Junagarh Fort, Camel Breeding Farm, Gajner Palace and Ganga Golden Jubilee Museum. Overnight at Hotel. Breakfast at hotel, drive to Jaisalmer 310km 5 ½ hrs drive, Golden City of Jaisalmer was founded by the Bhatti Rajput chieftain Rawal Jaisal in the year 1156. Jaisalmer could be regarded as the western sentinel of entire India and a place worth visiting to get an idea of the native Rajasthan. Located at the heart of the great Thar Desert, it offers the visitor an enchanting world of fable, colour, and history. Moreover, the magnificent wood-and stone-carved mansions and buildings display the love and interest Rajputs had for the fine arts. Rest of the day free for leisure. Overnight at Hotel. Afternoon visit Sam Sand Dunes, Ideal for viewing sunsets, these sites will also give you a chance to capture the picturesque sand dunes in your camera. Overnight at Hotel. / Night in Desert Camp. Morning drive to Jodhpur, Famous for its magnificent forts and palaces, Jodhpur is the second largest city of Rajasthan and a major tourist attraction in the country. On arrival check in your hotel, in the evening hours, experience the life, culture and tradition of Jodhpur lifestyle by walking through the Sadar Market. Overnight at Hotel. After a leisurely breakfast, sightseeing tour of Jodhpur, The forts and palaces in the city are the major source of attraction in the city. Exploring the forts gives you a feel of the times when the Rajput might was at its peak. The gates and the walls of the forts speak of the battles they have witnessed. One needs to spend enough time with these historical monuments to fully grasp the grandeur of the Rajput era. Some of the major attractions around Jodhpur are Mehrangarh Fort, Jaswant Thada, Umaid Bhawan & the Government Museum and Zoo. Overnight at Hotel. After breakfast at Hotel, visit Bishnoi village and continue drive to Udaipur on the route visit the beautiful Jain Temples of Ranakpur. After passing lush green valleys and streams and the heart capturing views drive away any fatigue of the journey. The Ranakpur Jain Temple was built during the reign of the liberal and gifted monarch Rana Kumbha in the 15th century. An enormous basement covers 48,000 sq. feet area. There are four subsidiary shrines, twenty four pillared halls and eligibly domes supported by over four hundred columns. The total number of columns is 1,444 all of which are intricately carved no two being alike. The artistically carved nymphs playing the flute in various dance postures at a height of 45 feet are an engrossing sight. In the assembly hall, there are two big bells weighing 108 kgs. Whose sound echoes in the entire complex? On arrival at Udaipur, check in at hotel. Rest of the day at leisure and you are free to experience the city by your own. Overnight at Hotel. 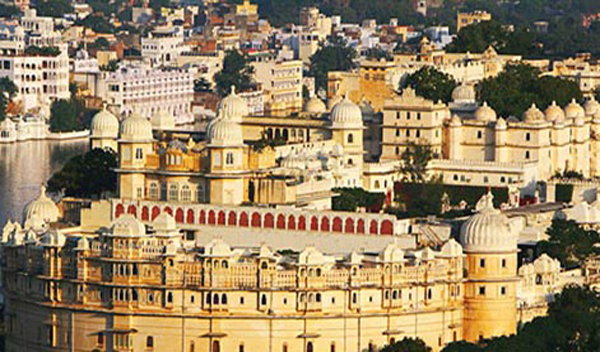 Located in the Aravalli ranges of Rajasthan, Udaipur is a fascinating blend of sights, sound and experiences. Right from the medieval times, the city has been an inspiration for poets, painters and writers. Founded in 1559 and named after Maharana Udai Singh, Udaipur became the capital of the Sisodia dynasty whose earlier capital was Chittor. The city is famous for its palaces, lake, museums, temples, and gardens. The City Palace and Museum is considered as the largest palace complex in Rajasthan and its museum has stunning collection of objects collected by different Maharanas of Udaipur over the centuries. The Picholia Lake, Udai Sagar, and Pratap Sagar are some of the most beautiful lakes in the state. Some other attractions in the city are the Jagdish Temple, Saheliyon Ki Bari, & Bhartiya Lok Kala Mandir. Afternoon free for independent activities, Overnight at Hotel. After a leisurely breakfast, you are free to explore the city by your own and in time you will transfer to Udaipur Airport for catch flight from Udaipur to Delhi, on arrival at Delhi, you will be transfer to International Airport to board on your scheduled flight return back to your home before 3 hrs before.